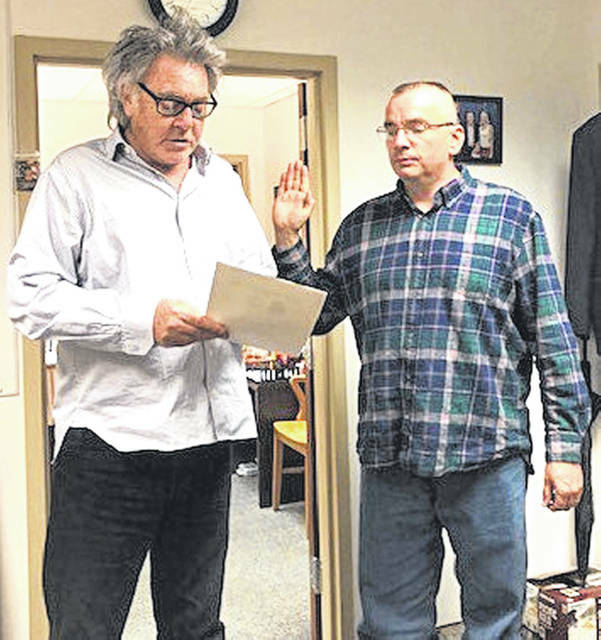 Hillsboro Mayor Drew Hastings, left, is pictured swearing in interim Hillsboro Police Chief Eric Daniels. Eric Daniels, who has been affiliated with the Hillsboro Police Department for 20-plus years, has been named the interim police chief, according to city officials. Daniels replaces Darrin Goudy, who resigned last Friday after city officials said discrepancies were identified in his time sheet. “Eric was chosen to serve as the interim chief based on a plethora of qualifications. Eric has … an associate’s (degree) in Law Enforcement Technology, a bachelor’s (degree) in Criminal Justice, and a master’s (degree) in Computer Information Systems,” Hillsboro Safety and Service Director Mel McKenzie said Wednesday in a text message. “He also served six years in the U.S. Marine Corps and is a Persian Gulf veteran. Above all of that is Eric’s institutional knowledge of the department, having been a patrol officer there from 1997-2005 and a reserve officer from 2005 until being recently named interim chief. Eric’s experience of managing a department’s budget is also a big benefit in having him step in and help the city. Daniels is a 1988 graduate of Chillicothe High School. He said he lived in Greenfield for a time, but moved back to Chillicothe with his wife of 22 years and three children about 10 years ago. “Challenge accepted. I like challenges,” Daniels said Wednesday of his reasons for accepting the interim police chief position. He said he came to Hillsboro more than 20 years ago to start his career in law enforcement, then has served as a reserve officer with the Hillsboro Police Department since 2005 when he became the city’s systems administrator. He said that while he is serving as interim police chief he will continue his duties as systems administrator, and that he has not decided whether he will apply for the permanent police chief position. McKenzie said the city does not have a time frame for hiring a new chief. As previously reported, McKenzie said Goudy, who became Hillsboro police chief in December of 2017, was “given the option to resign” because officials found daily duty logs kept by dispatch did not always reflect what Goudy’s time sheet showed.